No. 16 Virginia Tech defeated No. 23 Purdue 89-83 in the Championship Game of the Charleston Classic on Sunday night. The Hokies are now 4-0 on the season, while the Boilermakers dropped to 4-1. This was Virginia Tech’s first tournament championship since they won the Holiday Classic in Madison Square Garden back in the 2007-08 season. However, they only had to win two games to win that tournament, and the competition was Hofstra and St. John’s. The Hokies had to navigate three teams to win the Charleston Classic, and beat a ranked team in the Championship Game. Virginia Tech fell behind by as many as 12 points in the first half, but they found a way back into the game in the second half. Their backcourt trio of Justin Robinson, Nickeil Alexander-Walker and Ahmed Hill was the difference in the game, with all three of those players putting up huge numbers. Alexander-Walker and Hill played all 40 minutes, while Robinson played 39. Those three players jumpstarted yet another dominating offensive performance from Buzz Williams’ team. Virginia Tech was 30-of-55 (54.5%) from the field, 10-of-24 (41.7%) from the three-point line, and 19-of-26 (73.1%) from the charity stripe. The Hokies made more free throws (19) than Purdue attempted (11). Tech shot 18-28 (64.3%), including 6-of-9 from three point range, in the second half. Another important statistic was rebounding. Though the Hokies were outrebounded 33-28, they weren’t dominated by the bigger Boilermakers and their 7’3” Dutch center Matt Haarms. In fact, Haarms did not score and had only two rebounds. He entered the game averaging 11.3 points and 5.5 rebounds per game. Haarms’ performance is even more puzzling when you consider the fact that Kerry Blackshear spent most of the game in foul trouble. Virginia Tech’s redshirt junior center picked up his second foul just eight minutes into the game, and his third foul less than a minute into the second half. He did not have a big impact on the game until late in the contest. However, he still managed to finish with 13 points despite playing only 17 minutes, and he made some critical plays for Tech down the stretch. He was 7-of-11 from the free throw line. Virginia Tech was very good in the turnover category yet again. Though they only forced 13 Purdue turnovers, they had just 10 turnovers themselves, and they outscored the Boilermakers 19-8 in points off turnovers. They also limited Purdue to just seven second chance points. With four minutes remaining in the first half, things didn’t look promising for Virginia Tech. Purdue led 41-29 after a shot by Carsen Edwards, who was the Big Ten Preseason Player of the Year. 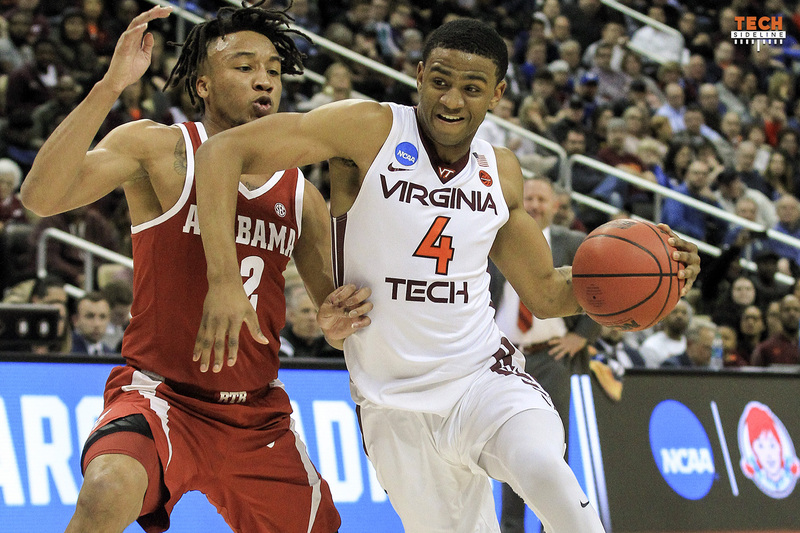 However, the Hokies toughened up on the defensive end to close out the first half, and found themselves down just eight, 44-36, at halftime. That was an acceptable margin, considering Blackshear’s foul trouble and how poorly the team had played defensively in the first 20 minutes. The second half belonged to Virginia Tech. The Hokies took their first lead with 12:33 remaining when Nickeil Alexander-Walker drilled a three-pointer from the left wing off a fastbreak assist from Ahmed Hill. That put Tech up 58-56, and though Purdue was able to tie the game twice after that, they were never able to retake the lead. Virginia Tech did a decent enough job of making their free throws down the stretch, and they held on for the 89-83 win. After the win, sophomore guard Nickeil Alexander-Walker was named the MVP of the Charleston Classic. He has scored 20 points or more in all four games this season, and is averaging 21.8 points per game. Look for the Hokies to move up from their No. 16 ranking when the new polls are released. No. 15 Syracuse lost two games in Madison Square Garden over the weekend, No. 13 Oregon was defeated by Iowa, and No. 8 Villanova lost to Michigan 73-56 and then got upset by Furman. Virginia Tech will return to action this Saturday, November 24, when they host Saint Francis (PA). Tipoff is scheduled for 1pm, and the game can be seen online on ACC Network Extra. Nolley should give this team some much needed size & depth that Clarke left. I hope he plays as well as NAW did last yr. as a freshman. Those boys can’t play 39-40 min every game. Great to see Med playing well ooc as usual. We need him to continue this same level into league play. Priority #1: Figure out how to keep KJ out of foul trouble. He’s so incredibly efficient with his limited minutes. Great Hokie game story line & unlike espn, kudos for avoiding gush over B10 preseason POY. I agree he has Curry like tendencies but Hokies went head2head w a good one & beat him & his team. Story line for Purdue IMO, win w 3s (1st half) or lose w 3s (2nd half). Great effort last night and a quality win over a tough, talented, and respected opponent. Bravo! Let’s keep it going, fellas, and make some serious noise in the ACC this year! Wow, a coach that makes half time adjustments to win the game. Buzz is a Coach,that brings the best out of his players. He is just as much fun to watch as the game. Wishing this group all the best this season. Good article. The general fan malaise regarding the football team this year might dovetail nicely into more enthusiastic than normal support for Buzz’s team. It’d be GREAT to see the Hokie faithful get super excited (as they should be!!!) about this team. They are fun to watch! Start packing Cassell for every dang game. All that energy the fans never got to use on the football team this year…I know it’s still there, pent up. Let it loose on hoops. This team, this coach deserve it. Exactly. B-ball fans need to support the team like crazy. a – the lady Hokies. off to a fine start under Coach Brooks, and i believe under-rated by media and conference. lots to like there and cheer for! b – the wrestling team. despite the mizzou loss, there is proven talent there and an ongoing winning tradition to stay behind and add even more support and enthusiasm! congrats to all three winter sports and their good starts. don’t waste it Hokie students and ‘Burg-ers; lots of y’all show up loud in Cassell and Moss and have some good fun! Winning in any sport has a way of getting fans in the seats. BB team is good and Hokie fans will be behind them no doubt. Go Hokies!!!!! I agree. The basketball start is helping ease the pain of the football season. Buzz is a great coach, but he also has a roster of older, experienced players. Imagine the football team a couple of years from now, and perhaps our disgruntled fans can put things into perspective. Thanks to Hokie BBall for giving us something to cheer about! Just when I thought Blackshear had learned how to stay out of foul trouble … that early charge driving to the basket was something to behold. Despite all the minutes from our big 3 scorers the defensive intensity was still there at the end and they still shot a high % late in the 2nd half. And that was 3 games in 4 days. A lot to look forward to this year! I heard the announcers saying that AW could leave after this year. Please no! Excellent Smithers! After VT and Redskin football fails this weekend, the round ballers came through big time.